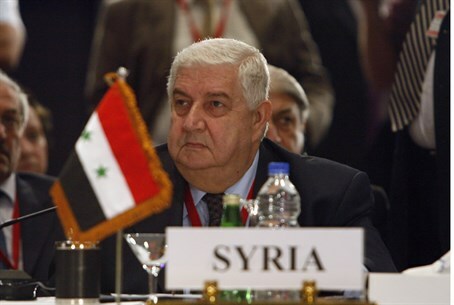 Syria's Foreign Minister visits Oman, agrees with counterpart to work together to end brutal civil war. Oman and Syria agreed on Thursday to work together to end Syria's brutal war, official media reported, as the Syrian foreign minister Thursday made his first Gulf visit since the conflict erupted in 2011, according to AFP. Foreign Minister Walid Muallem met Oman's chief diplomat Yussef bin Alawi to discuss "several regional and international topics of common interest", the official Omani news agency ONA said. They agreed "that now is the time to unite the efforts to end this (Syrian) crisis", according to Syria's state news agency SANA. "The two sides agreed to continue cooperation and coordination to achieve the shared goals of their peoples and governments," the Syrian news agency said. The Syrian daily Al-Watan, which is close to the regime in Damascus, pointed out that Muscat had not cut diplomatic and political ties with President Bashar Al-Assad's government, unlike other Arab countries in the Gulf. It was Muallem's "first visit to an Arab state in nearly four years, at the official invitation of his Omani counterpart", the paper reported in announcing the visit. Al-Watan also wrote of a possible meeting in Muscat, a traditional mediator in the region, between top diplomats from Syria, Iran and Saudi Arabia. Iran, along with Russia, is a key backer of Assad, while Saudi Arabia is a prominent supporter of the opposition and rebels fighting to topple his regime. On Wednesday, Muallem was in Tehran, where he met with Iranian President Hassan Rouhani. The Syrian minister also met with Mikhail Bogdanov, Russia's deputy foreign minister and special representative to the Middle East. Following Muallem’s visit, Iran said it would submit a new peace plan for Syria to the United Nations, which would be an amended version of an Iranian initiative presented last year. The Syrian Observatory for Human Rights said on Thursday that more than 240,000 people, including 12,000 children, have been killed in Syria's conflict since March 2011. The Observatory added it has documented the deaths of 240,381 people, up from its tally of 230,618 announced on June 9. The latest toll compiled by the Britain-based group shows that 11,964 children were among 71,781 civilians killed in Syria.